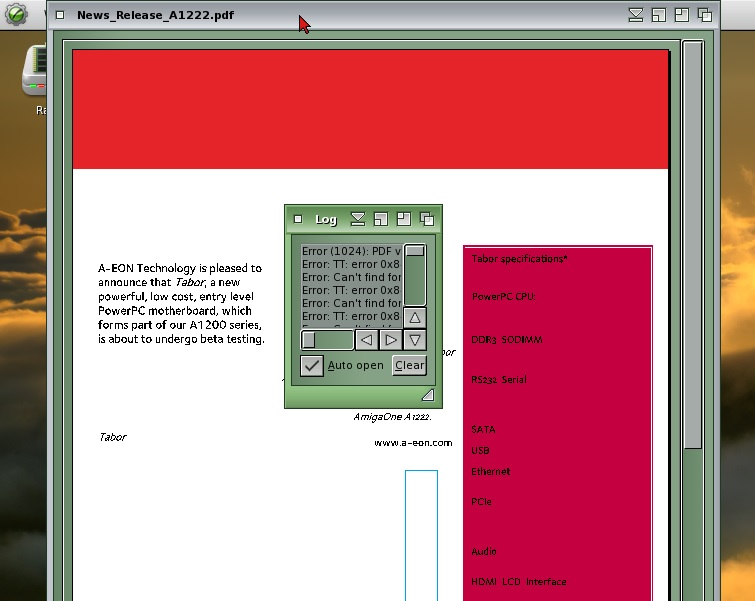 One word on the beginning - whole text has been wiritten by man, who has small knowledge about AmigaOS. I know some, but for sure I'm far from beign an expert. The goal of test session (and this article, of course) was to check, without any start points, what customers will receive buying AmiKit. Please remember, that AmiKit is a commercial project. 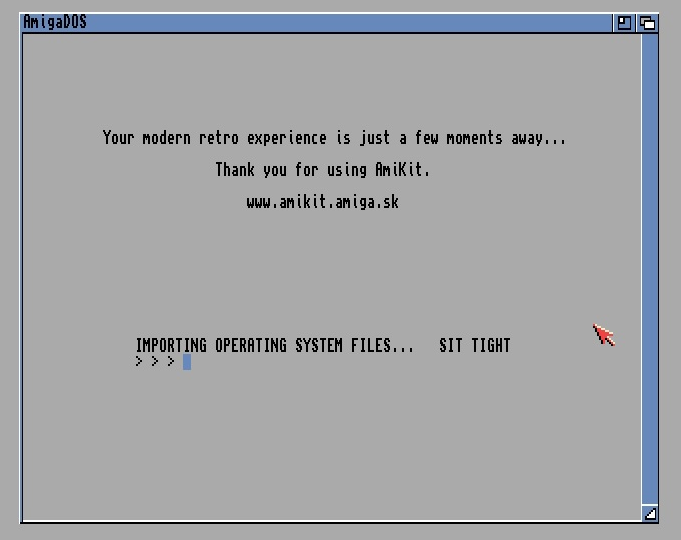 AmiKit X was a part of ALICE project - the way to get Amiga laptop. Anybody remember it? Just a short summary - the common laptop with x86 processor and AmiKit/Amiga Forever launches just on the beginning (and Linux as background, of course). Information about ALICE has been removed from A-EON website, but internet remembers. If you want to read more about this project, here is official doc. I have no info about success of this projecy and number of sold laptop. If you want to buy such laptop, please visit Rabbit Hole Computing website. 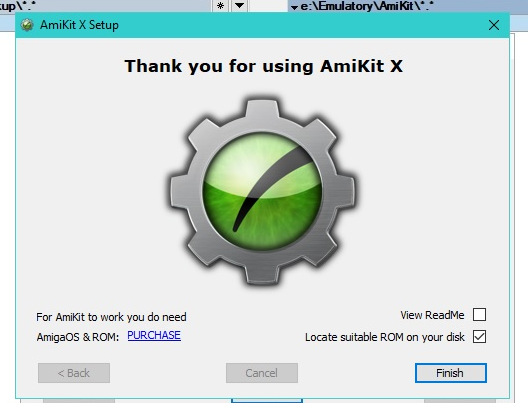 But anyhow, we have AmiKit X! 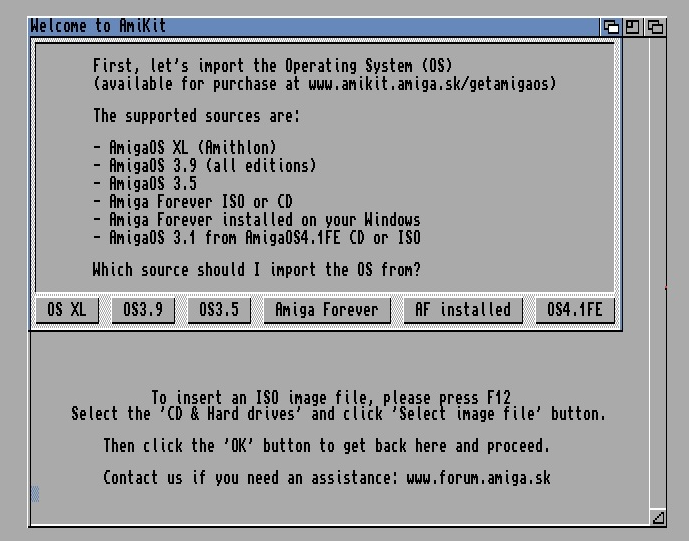 I used Amiga Forever, already installed on my laptop. It has been detected correctly. Please remember to set a proper resolution. It is very important, because using wrong resolution it is hard to hit buttons inside AmiKit. Yes, I know, it is strange, but it exists. Just on the beginning we are informed, that our version is not up to date and we should update it. So... we did it. Let's start from the language. English is default, that's obvious, but let's change into Polish. Please remember, that it will have impact only on the system - all aplications will stay English, as they are. Settings are quie clear and logic. 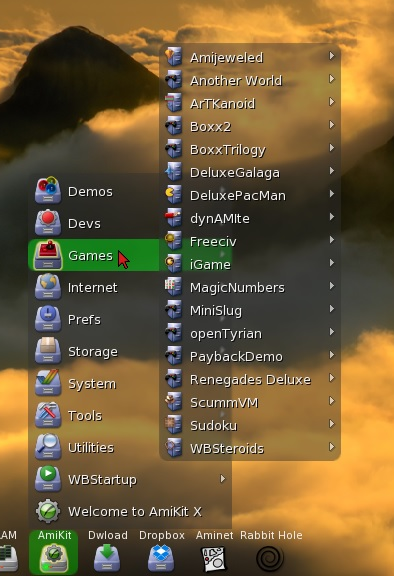 They look similar to AmigaOS with already installed addons/packages. I would like to avoid writing about all of them. Just want to mention, that there are lots of different settings and you are allowed to change nearly everything. 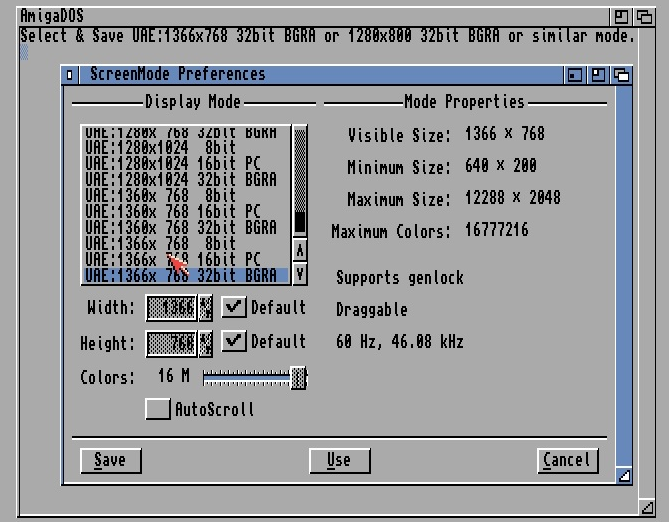 To be honest, wide range of configurability was always huge advantage of AmigaOS, and nothing has been changed here. Just after installation Dopus Magellan is available - it is very important, especially if you want to copy file in comfortable way. Just on the beginning AmiKit is well configured and already optimized, so you don't have to set anything urgently. Of course, there is nothing against to set everything in your way. You are welcome. One disadvantage, which I found, is that if you press RMB on the "windows-like" button menu and next trying to change, the menu is disappearing. And here is a results. Do you feel better right now? In internet category we will find lots of different programs. So there are browsers, FTP programs, IRC applications, instant messaging programs, email clients, amiTwitter and modem handling. As you can easily see, they are connected with internet history. Nowadays, browsers and modern protocols are so powerful to cover all of these activities (in fact, part of them became obsolete). But let's take a look from common user's point of view. Just after a while you can recognize, that programs are oldfashioned comparing to software, which we have currently on our computers with Windows and Linux. So we have quite a nice trip to the middle 90s, to the country of Netscape, modems and IRC channels. Do you feel old? 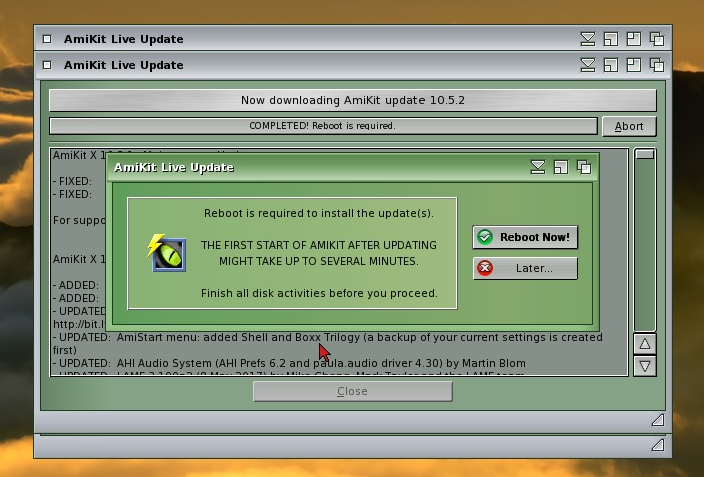 We have (bravo) FTP with already configured Aminet access, so we can directly download installation versions of programs. There is no problems to have a discussion using ancient IRC. What's more - you can meet people there. Yes, I was also surprised. PS. There's eXec's IRC channel - more info is here. 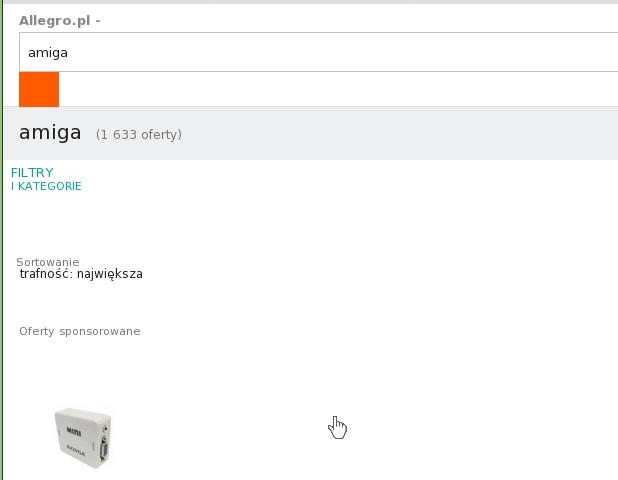 System does not recognize Polish signs by default. Switching default language in Morpheuz settings makes proper displaying. In fact, it is just an illusion. Why? 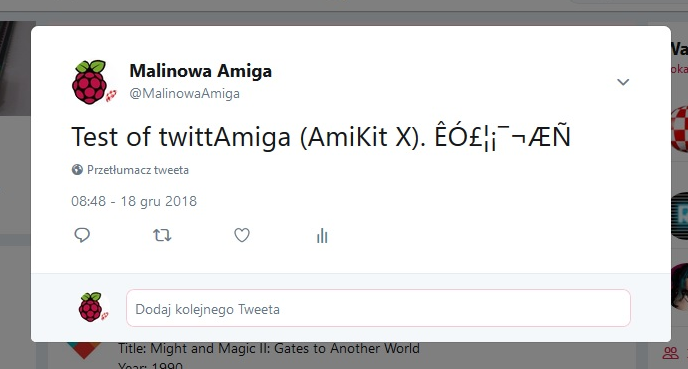 Let's try to add new entry on Twitter using twittAmiga, using Polish signs. Regarding browsers, all website use newest web technologies will be not displayed properly. 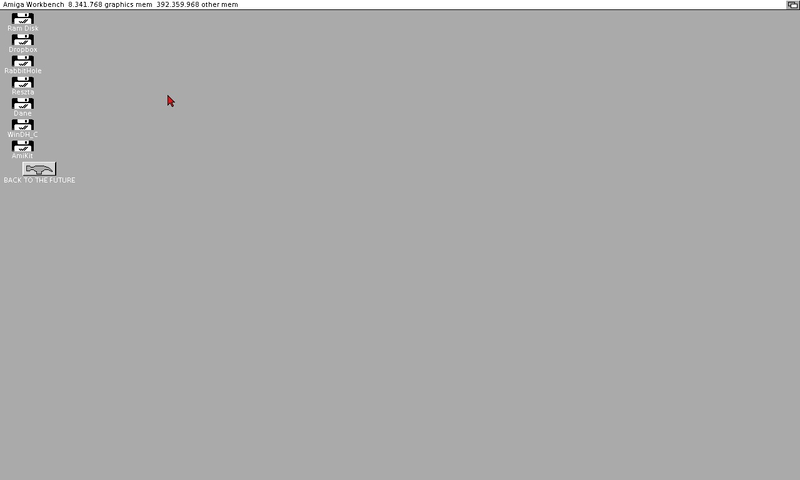 Old Amiga browsers does not support CSS. Welcome in 1996. Please treat it like retro-journey. What we have here? Few small, old text editors (for example "microgold", which could be used for simply development) and PDF reader (which can't handle extended documents). Not too much. But we can always use Libre Office using Rabbit Hole, but it will be presented later. Together with package we are receiving number of games. It's not a huge package, but name such Another World makes impression. 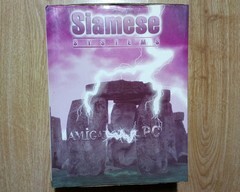 We have also few adventure games, together with ScummVM. 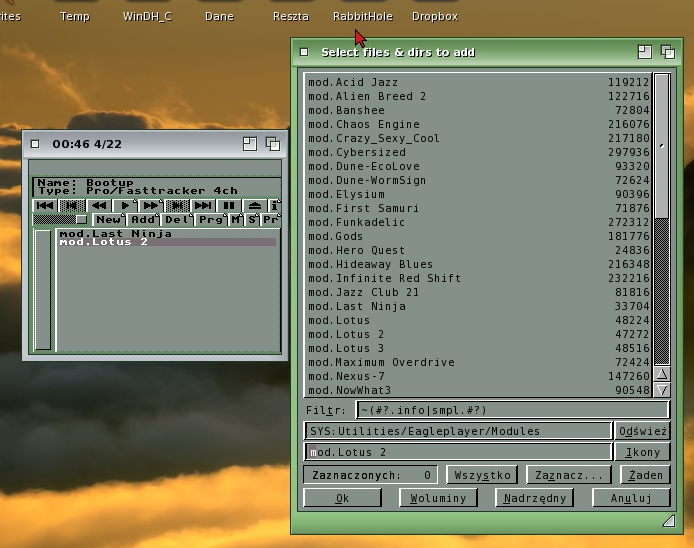 And iGame, which is graphic interface for WHDLoad. 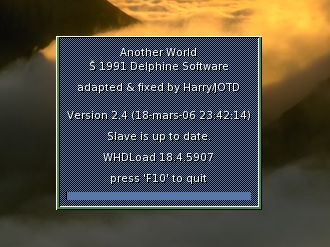 Just after choosing Another World we are receiving window of programs launched using WHDLoad. Game will start immediately. List of the games is ok for the beginning. I tried to instal additional, but without any success. As a begginer, I had to gave up. One thing is obvious and it is missing - better handling of ADF files - I will back to this point in the summary. Testing and writing of review is not a piece of cake. It is time consuming and sometimes I had to relax myself. So how about a good movie or some relaxing music? 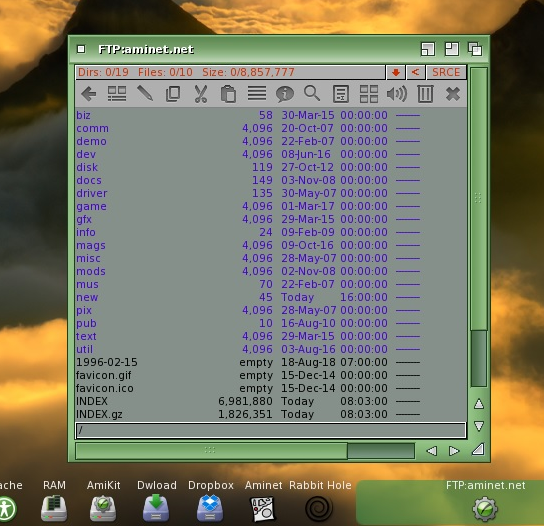 Generally it works fine (I'm not a demanding user) and multimedia part of the system is just ok.
AmiKit's authors recognized, that software for AmigaOS 3.x is old and quite poor, so they decided (within ALICE project) for alternative solution called Rabbit Hole. 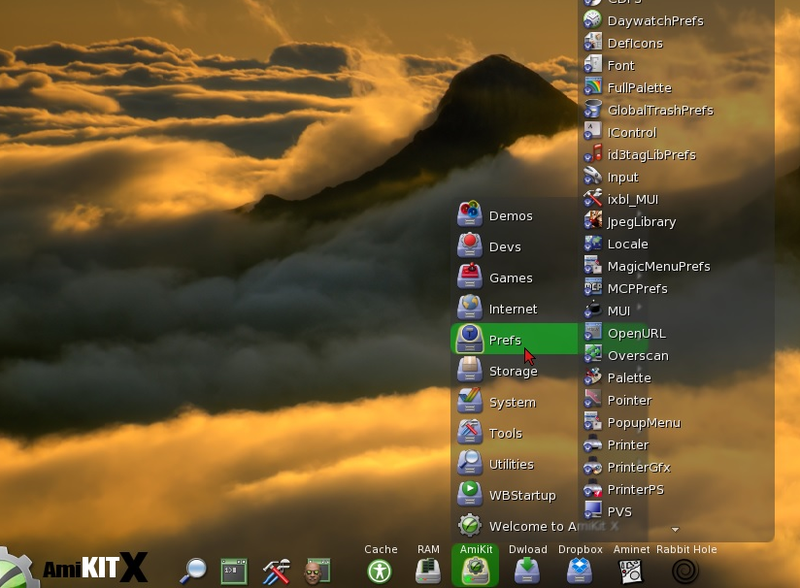 It is feature, which allows to run program directly from Windows or Linux. I don't know how it works on laptop with ALICE, where AmiKit starts on the beginning. On my own computer with Windows 10 it's just a new window, new appliaction - it looks the same like launching Firefokx from Windows level. There is no deep integration, but copying texts works fine using clipboard. - Graphics! Just on the beginning we are receiving nice graphic theme aligned to our resolution. 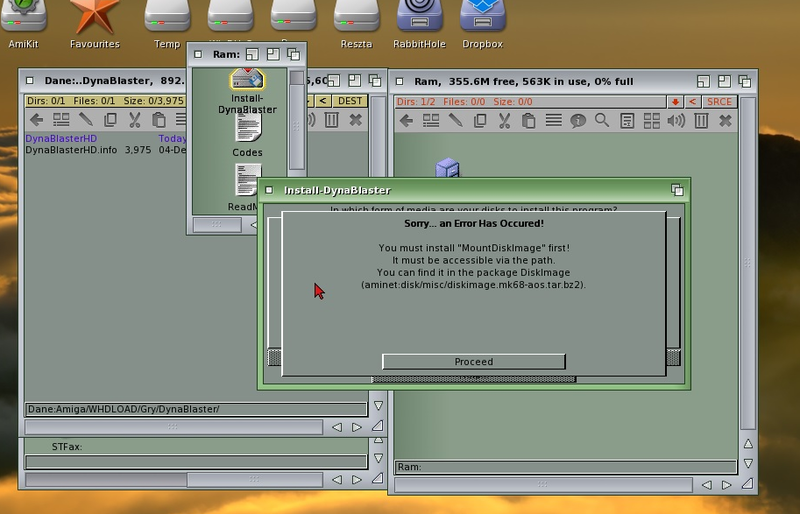 - Just on the beginning lots of already installed software, configured and ready to be used. 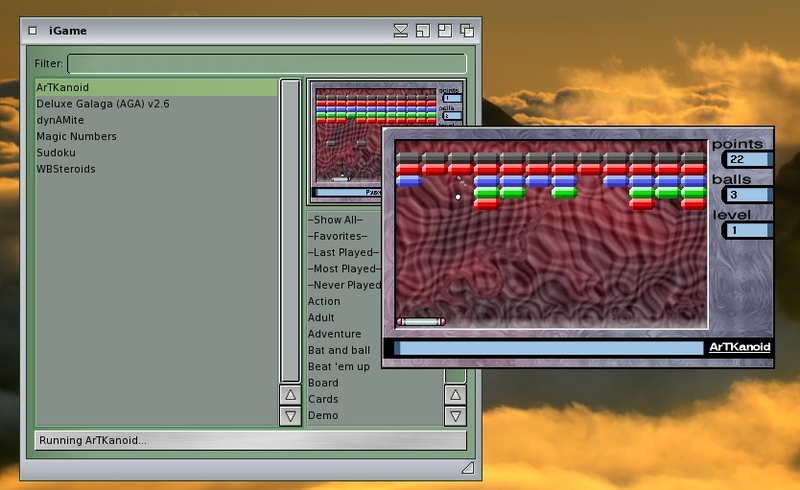 - WinUAE, as "and engine", which is the best Amiga emulator on Windows. Problems with switching sing keys ALT + TAB on Windows during test sessions - I had to make printscreens and notes (my resolution is 1280*768). I had to press F12 and next ESC. Clicking on the files in AmiKit occurs opening them in Windows. Opening from program level works fine. Clicking RMB on the menu didn't allow me to modify it. What can I add here? I think, that I already cover main goal - description of first conatact of common user with AmiKit package. User, who had contact with Amiga, but is not an expert at all. General impression is very positive. It costs about 30 euro. Is it worth the money? 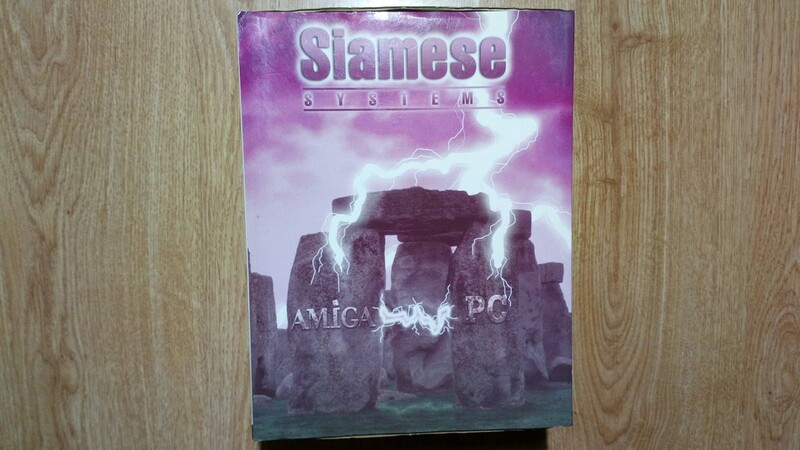 Please remember, that you have to also buy ROMs separetely ( for example within AmigaForever). 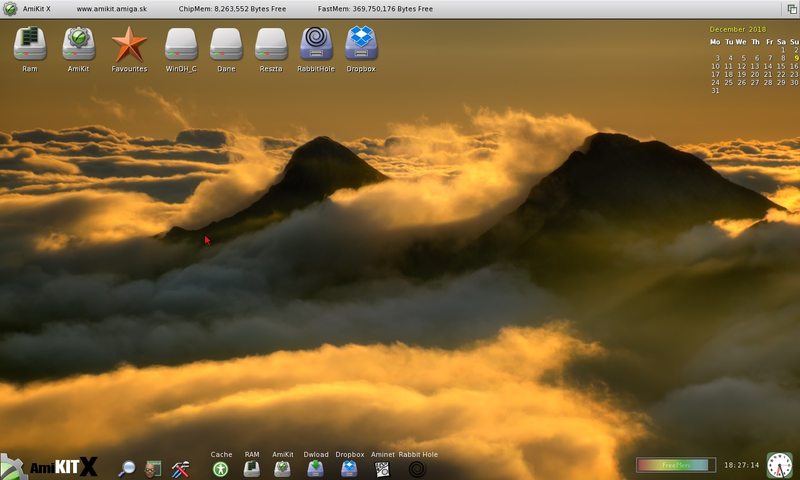 Most of attached software is free and you can download and instal by yourself. The issue is that there are old software with strange dependecies and tricks to be done before installing. Do all such activities by ourself, solving problems and searching in internet for any help (part of projects are already abandoned by authors) is hard way and time consuming. So instead of retro-fun we can just make angry. I met such problems many times and it is not a pleasure, for sure. If we don't have enough time and don't want to stress up, then we can just purchase package and just having fun. In Polish language we have sentence "to purchase cat in the sack" (kupować kota w worku) - it means to purchasing something unknown, unsure. 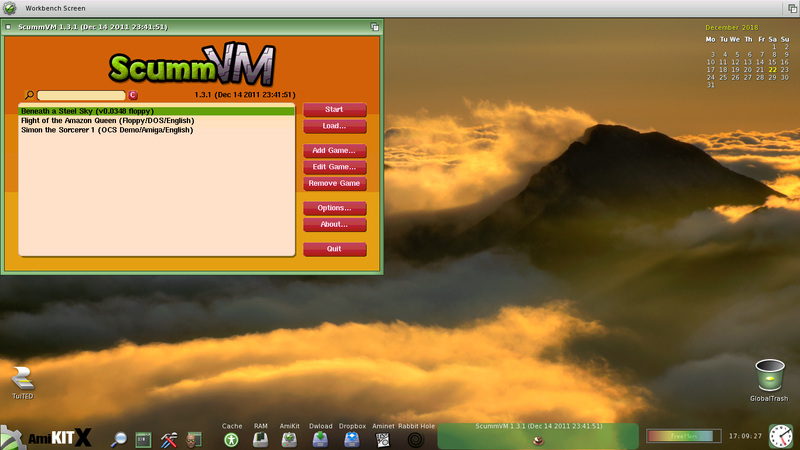 To avoid such feeling we are able to download older version (8.5) for free and we can test AmiKit. On the end I would like to add one thing, which I missed - handling of ADF files. 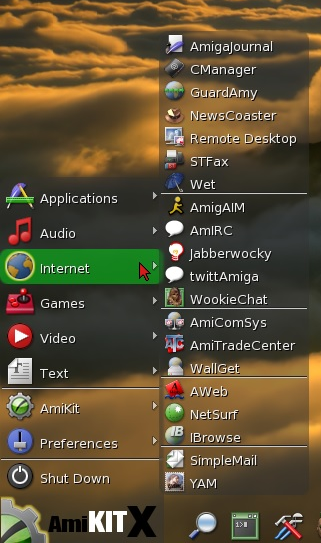 How about adding AMI.G.U.L.A (Amiga Games UAE Launcher) program inside AmiKit? That's only suggestion, but for sure it will increease functionality and customers satisfaction.